Shoes and boots that use the standard midsole layer of blown foams (EVA or PU) are using old fashioned technology. These foam materials collapse and deform to soak up energy to provide cushioning. Shoe companies like these foams for simple, quick and cheap shoe construction. Floor mat companies like and use these foams for the same reasons. However, over a short time, these foams bottom and thin out, no longer offering what needful feet require. Foam boots have failed in situations that have resulted in injury. Situations requiring enhanced protection, stability, and energy efficiency. FEMA has reported that 30% of injuries during post-tornado activities was the result of stepping on nails. This is the sole assembly of an US Army Regulation AR-670-1 compliant combat boot (issued to the freshmen cadets at USMA) with the mandated 100% polyurethane blown foam mid sole. This type of boot system is insufficient for our soldiers’ battlefield requirements for the practical reasons that it is heavy (1.4 pounds), offers minimal puncture and blast protections and does not provide enough shock reduction for feet and lower limbs from impacts that result in heel pain and stress fractures. Materials such as Kevlar® and other Aramid synthetic fibers and light weight, extremely strong carbon fibers can be used for manufacturing the best shoes. The best materials are light weight and have extremely high tensile and impact strength, as well as high resistance and tolerance against extreme environmental conditions. Because of their superior strength to weight properties advanced composites are often used in aerospace, body armor and in the fastest race cars. The penetration graph presented above is of prior independent professional laboratory testing showing that tested insoles could attain up to 10x times more puncture protection per ASTM testing over the currently mandated US Army Regulation 670-1 required polyurethane PU, foam-based, combat boot systems and over the softer EVA ethylene vinyl acetate shoe foams. Flax composites can be utilized when the protection of our environment is the mission, reducing the pollution caused by discarded denaturing foam shoes in landfulls and reducing the amount of fearsome flotsam in our waterways and fisheries. Currently over 35 billion cubic liters of footwear foam waste is produced yearly globally. Foam that’s eaten by fish that you may eat or foam slowly leaches its potentially harmful chemical components into ground water over the next 10,000 years that your children’s children children may drink. 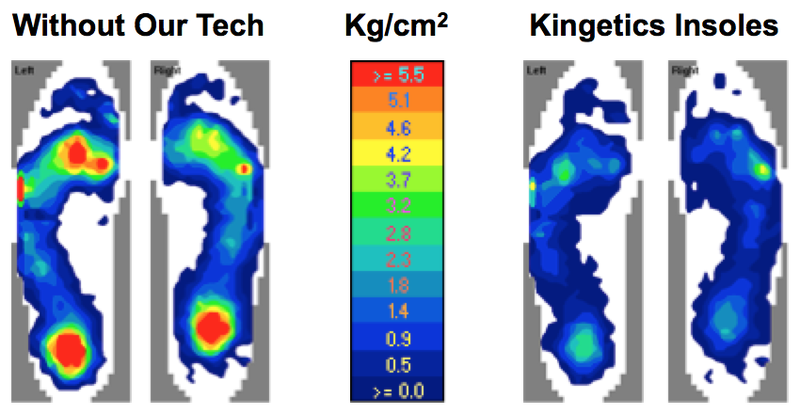 Kingetics Insole System takes advantage of the most powerful simple machines in the universe: The Lever and The Wedge . Archimedes of (F1D1=F2D2) fame was a big fan of the lever and so are we. Our molded cradle arch supports use a lever and the spring plates use FOUR SIMPLE MACHINES balanced in a closed kinetic chain utilizing: an incline plane wedge, a mid-stance lever, a decline plane wedge, and a long lever spring. Thus utilizing mechanical advantage to limit the work of ambulation. Kingetics improves pressure dissipation across the entire foot by transferring the loads off of the high pressure areas of the foot and distributing the load out the spring lever mechanism over a greater ground contact surface area. Kingetics- Making Our Soldier Safer One Step at a Time…TM Our primary objective. Kingetics- Making the less ambled The More Ambled…TM Our mission statement.